Correct posture is at the core of the Advanced Spinal Correct Method. The curves in your spine act as levers, shock absorbers, and resistance to gravity; they also protect and reduce forces acting on the spinal cord and nerve tissues. But, gravity, age, poor posture, improper physical activity, injury, and disease can all play a role in the misalignment of your spinal curves and, as a result, your entire body. The postural and spinal displacements are the determining factors for deriving a patient’s individualized program of care. Prior to performing advanced spinal corrective methods Mirror Image® postural set-ups, a Revive Chiropractic Centers doctor will determine your initial presenting abnormal posture. Ideal posture can be precisely described as vertical alignment of the centers of mass of the head, ribcage, and pelvis with respect to gravity. Using this definition, abnormal postural rotations and translations can be determined. Mirror Image Adjustments, assists our chiropractor in the rehabilitation of the patient’s posture. In theory, these adjustments will rebalance the bodies’ sense of proper balance or alignment by way of triggering improved muscle and nerve reflexes. Thus, postural adjustments as performed with drop table, hand-held instrument, or even mirror image manipulation procedures, are performed for resetting the nervous system regulation of postural muscle balance. This patient has forward head posture and the skeletal animation shows what happens to the spine with this posture. On the right is the Mirror Image adjustment. The posture is placed in its opposite position and then a Chiropractic adjustment is performed. The patient has right lateral ribcage posture and the skeletal animation shows what happens to the spine with this posture. On the right is the Mirror Image adjustment. The posture is placed in its opposite position and then a Chiropractic adjustment is performed. Mirror image® exercises are performed to stretch shortened muscles and to strengthen those muscles that have weakened in areas where postural muscles have adapted to asymmetric abnormal postures. 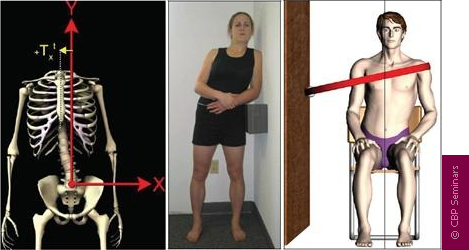 Although strength and conditioning exercise has not proven to correct posture, postural exercises performed in the mirror image have shown initial promise in the reduction of posture and spinal displacements. The patient has an abnormal forward head posture and the skeletal animation shows what happens to the spine with this posture. On the right is two different Mirror Image exercises, one with just the patient’s muscles and body as resistance and the other with an elastic band for increased contraction effort. The patient actively maneuvers their posture into the opposite or Mirror Image position.